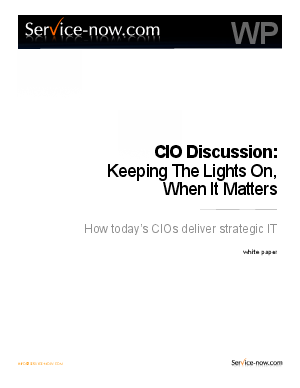 Recently nine enterprise CIOs and IT leaders were brought together to discuss how to successfully execute IT strategy in today’s world. They represented large IT organizations from a broad cross-section of industries, from manufacturing and logistics to financial services, from professional and business services to scientific research. In this discussion, they shared their experiences and pooled their thoughts on modern best practice for delivering IT services. This briefing paper summarizes the key findings of this real-work executive level discussion.